Election season is known for controversies. This year, the politicians have gone a step ahead in calling each other names and passing derogatory remarks. In an alternative way, they are also threatening the voters to vote for their party. The second phase of Lok Sabha elections is all set to happen tomorrow, April 18. The elections in Tamil Nadu and Pondichery will happen on the same day. In Chhattisgarh, the first phase of elections is over and the second phase will be on tomorrow. 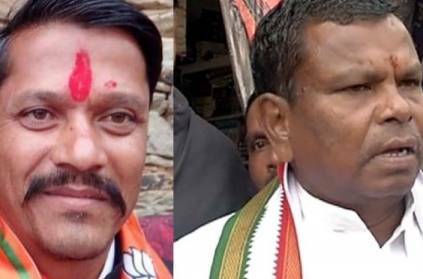 While campaigning, a Congress minister, Kawasi Lakhma has stirred a row by claiming that if someone presses the second or third button instead of the first (meant for Congress candidate), then it will give them electric shock. He said, "You have to press the first button to vote for Biresh Thakur. The second button will give you a current (shock)." The election commission has issued a notice demanding explanation. Also on Tuesday, Ramesh Katara, a BJP legislator from Fatehpura, warned people that Modi has installed camera in the polling booths to to check if they are voting for BJP. He said, "There should not be any room for error as Narendra Modi has installed cameras inside the polling stations this time. We will know who has voted for Congress. Those who don't vote or vote for Congress will be identified and not given work." Earlier, BJP's Menaka Gandhi has asked the muslim community to vote for her or they won't receive any help. 'அது எப்படி எதிர்க்கட்சித் தலைவருங்க பத்தி மட்டும் வருமான வரித்துறைக்கு துப்பு கிடைக்குது’.. ப.சிதம்பரம் ட்வீட்! This page contains news relating to various facts and events. The views are generally about current affiars and general topics in diversified areas such as political, international, national, and regional issues, sports, health, travel, lifestyle, technology and business. People having similar interets on the above topics will find this page useful. Politicians threaten public during campaign | India News.